Getting outdoors is essential for a healthy and happy life. The Greenville area has some of the most scenic outdoor places in the country, perfect for hiking, biking, jogging and walking the dog. 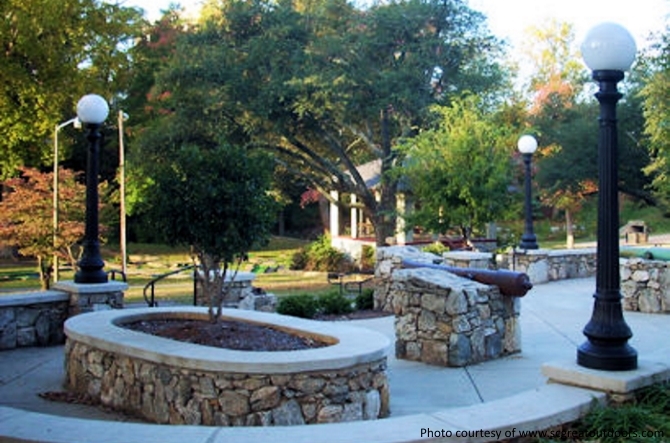 Check out these best neighborhood parks in Greenville, SC to focus on the areas where you should purchase your next home. 21-acres of land welcome you at Gower Park. It’s nestled in a beautiful neighborhood off of Evelyn Avenue in Greenville. You’ll find plenty of activities to keep you busy for an entire day and well into the night. The basketball courts and 9-hole disc golf course are great for sports enthusiasts. 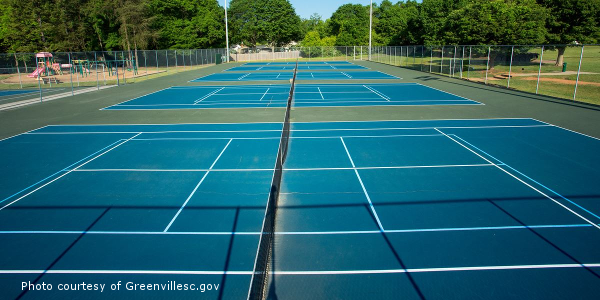 The tennis courts are also lined with pickleball courts making them a favorite spot to spend a beautiful day. Dog owners enjoy taking their pups around the one-mile walking trail. Stick around at Gower Park after dark and enjoy the many softball games played under the lights. Located near the Lake Conestee Nature Park, this park offers easy access to many different nature trails. This park is a favorite spot for hikers and bird lovers. The new playground makes it a perfect place for family afternoons. We love the way the park focuses on nature and incorporates it into the playscape. Conestee Park is also an excellent spot for those baseball players with enough room to spread out for a quick pick up game or some epic frisbee with the dog. Located on Rocky Slope Road, Legacy Park offers expansive green space that’s great for stretching your legs and meeting your step goal. This park is modeled after New York’s Central Park and offers plenty of grassy areas alongside beautiful gardens. We especially love the landscaping with ornamental grass and other native plants that have been carefully cultivated throughout the park. You’ll find families enjoying a picnic in the sun and kite flyers looking towards the sky on a breezy day. Legacy Park includes a volleyball court as well as a few playgrounds. A brook and pond are also on the property making it a world of discoveries for the young and old. Established in 1884, McPherson Park is the oldest park in the city. Its 12.5 acres feature outdoor activities like tennis, walking trails, and a playground. McPherson Park is a great place to play a game of miniature golf with the family. You’ll find clean bathrooms, plenty of trails to enjoy, and beautiful lawns and gardens to explore. You’ll find two playgrounds at Herdklotz located on Beverly Road. 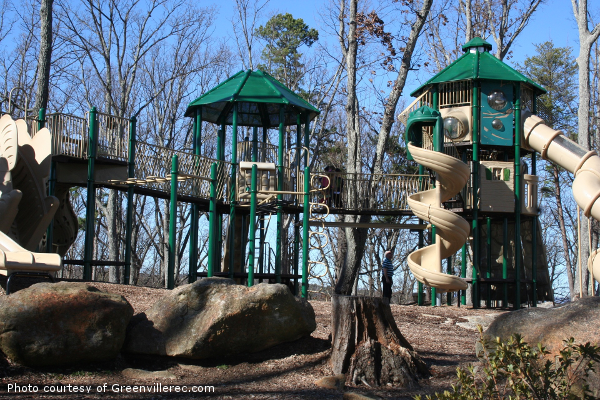 This unique park includes a massive play structure that larger kids will enjoy. Nearby residents enjoy the view of the city as well. Plenty of mature trees provide shade for both the playgrounds and the walking trails and benches making this an easy choice on a warm day. Bring a volleyball to play with friends on the volleyball court or some horseshoes for a relaxing afternoon. 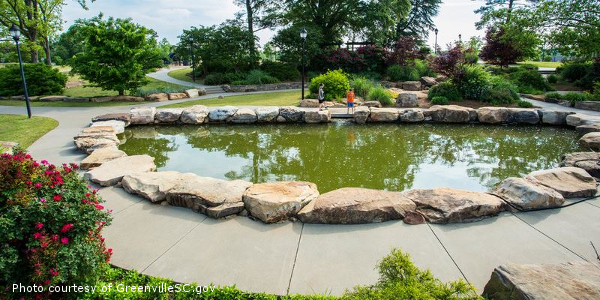 There are plenty of beautiful parks that are nestled right in some of the best neighborhoods in Greenville. You’ll find green space and walking trails mixed with sports courts and fun playgrounds for the little ones. 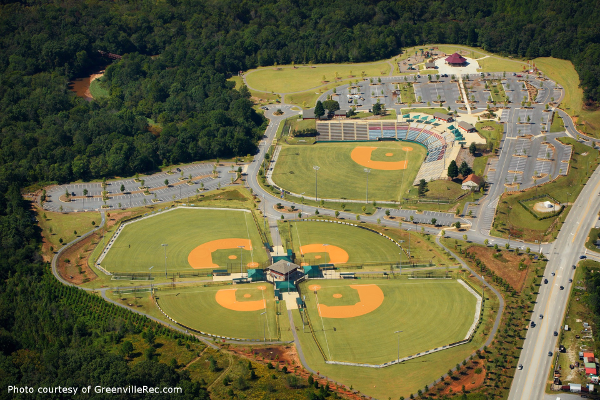 Check out all of these best neighborhood parks in Greenville, SC when searching for your perfect home.